Reading the Fantastic Four comics from the start. Issue #402 is part ten of the eleven-part Atlantis Rising crossover. I don’t know about you but I’m getting Atlantis’d out. In Atlantis, it’s revealed that the battle severed Morgan’s psychic link with Thor. She still has her energy field intact around Atlantis, though, and she reveals she has aquatic Ihuman Triton trapped in a “geneti-globe” and she hopes to use him as her pawn. She also has the Inhuman city of Attilan, shrunk down to tiny size and trapped in a bottle. Nathaniel Richards is also there, having been taken prisoner by Atlanteans. He tells Morgan that he has the means to restore Attilan to its proper size. We then catch up with the Inhuman Royal Family, still living in exile in a New Jersey circus. They are contacted by their enemy Arcadius, head of the Genetic Council. 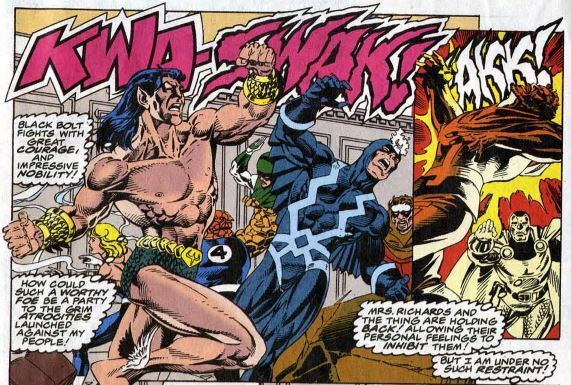 They agree to set aside their differences, only for Arcadius to saw that if the Inhumans are to survive this conflict, they must destroy Namor the Sub-Mariner. We then appropriately cut to Namor, who has been rescued after a defeat earlier in the crossover. He’s been nursed to health in an undersea cave by Atlantean sorcerer Vashti. Namor says he wants vengeance against those who displaced Atlantis, but Vashti argues that Namor’s people need a leader and a healer instead. The FF arrive in London, and the Inhuman Royal Family see a news report about them. The FF meet with NATO officials in a conference room inside an unidentified mansion (could this be Downing Street?!?) where they debate about what to do about Atlantis. The Royal Family teleports right onto the conference table. 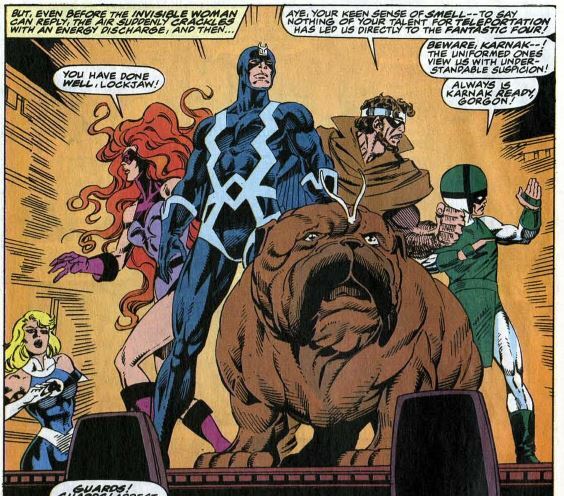 The NATO guys think this is an attack, but Sue vouches for the Inhumans. Then there really is an attack, when Namor bursts through a window, hoping to get his revenge, rather than the “leader and healer” stuff. Vashti apparently never filled him in about the whole Royal-Family-living-in-exile-at-the-circus thing. 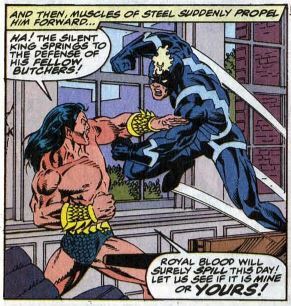 Black Bolt fights Namor, and the two are pretty evenly matched. The exchange blows, and Black Bolt actually uses his energy antenna as a proper weapon, something we don’t see him to that often. Meanwhile, Ant-Man fights Lockjaw, Karnak fights Ben, and Gorgon (who, let’s not forget, once single-handedly defeated the FF) fights the NATO security guards. 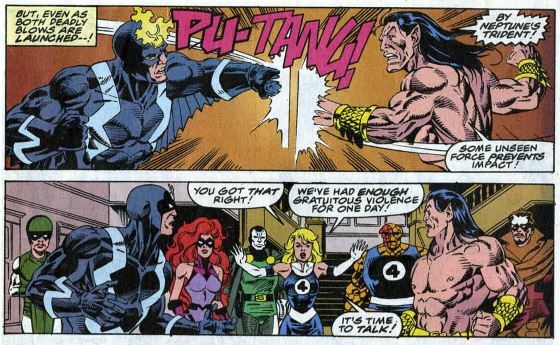 Sue breaks up the fight by putting a force field between Black Bolt and Namor. In Atlantis, Morgan reveals to Arcadius that she has procured the city in the bottle and the means to restore it. Arcadius then contacts the Royal Family and says they must teleport to Atlantis at once. They do, leaving the FF behind in England. Sue says they must pursue, except that they have no way of breaking through the energy barrier around Atlantis. Then Thor shows up again, saying that he’s free of Morgan’s spell. He says he can get them to Atlantis, where he will have his revenge. Fade out: Sue spends the whole issue trying to act as negotiator, hoping to stop the fighting and get everyone to listen to reason. Clobberin’ time: This issue’s letters page announces a new Thing solo series coming later that year. It never happened, though. Ben wouldn’t get another solo series until Thing: Freakshow, seven years later. Flame on: Starting this month, Johnny took over as the new leader of the spinoff team Fantastic Force, which is why he won’t appear in this or the next few issues. Fantastic fifth wheel: Lockjaw defeats Ant-Man by pinning him to a wall, so that Ant-Man can’t get to his shrinking gas. 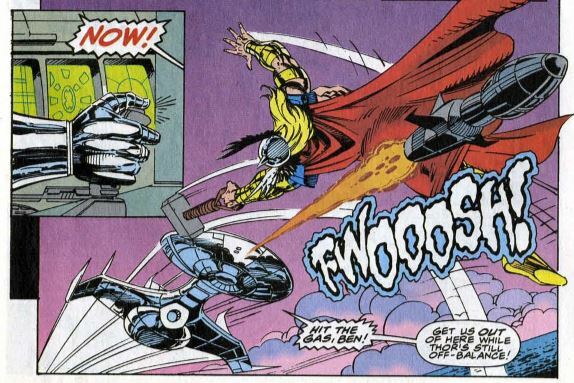 Kristoff continues to question the FF’s no-killing rule, suggesting that they might have to kill Thor, even if he ultimately chooses against it. Later, none of the officials in London question why someone who looks and acts just like Dr. Doom is with the FF. Maybe Sue phoned ahead and informed them that Kristoff is on the team now. Medusa’s only role in this issue is to act an interpreter for Black Bolt. Her and Black Bolt’s son Ahura appears in one panel while at the circus, in case anyone’s wondering whatever happened to that character. 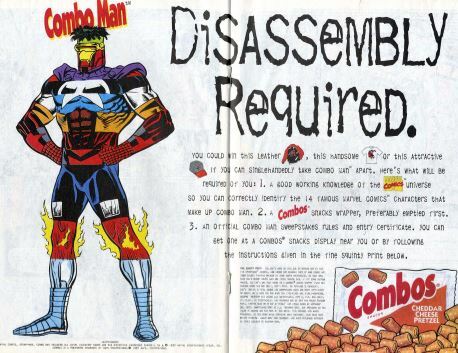 Commercial break: Whatever happened to Combo Man? Trivia time: How did Atlantis Rising end? Morgan Le Fay was defeated, and Attilan was restored to its original size, trashing Atlantis in the process. The Atlantean people were displaced and the Inhumans took over ownership of the now-combined Attilan/Atlantis. Fantastic or frightful? 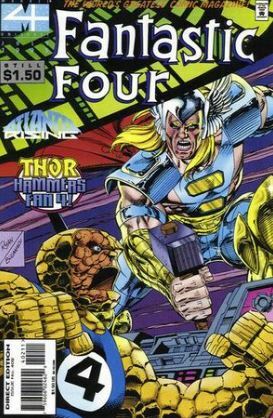 There’s a lot of fun action in this one, with the spaceship vs. Thor fight and the Black Bolt vs. Namor fight. Unfortunately, I have a hard time caring about all this Atlantis vs. Inhumans conflict as it gets more and more dense. Yet another mixed bag. Next: Thing ring, do your thing.